Charlotte, October 10, 2017 – Widely recognized as two of the world’s leading organizations dedicated to science-based sports nutrition and distribution of top health and sports supplements, Europa Sports Products and the International Society of Sports Nutrition (ISSN) announced today the next step in their collaboration, making Europa Sports a professional member of the ISSN. I’m pleased and honored to have Europa Sports and CEO Eric Hillman as part of the ISSN community. Bringing together the industry with science can only result in better products.” said Dr. Jose Antonio, CEO and co-founder of the ISSN. From pre-workout to recovery, the science of sports nutrition has changed the game for athletes, trainers, and coaches. Europa Sports has played an instrumental role in this revolution since 1990, educating the sports community and distributing evidence-based nutrition that can enable athletes to train harder and recover faster. The new membership with ISSN will generate multiple benefits for Europa’s growing roster of mass market retailers, gyms, box owners, health food stores, and specialty supplement stores. In addition to delivering leading-edge nutrition management to its’ customers, Europa’s Professional Level ISSN membership will lead to more informed teams and therefore customers in all segments and levels. This partnership also offers increased exposure to scientific studies, and stronger networking opportunities with industry leaders. 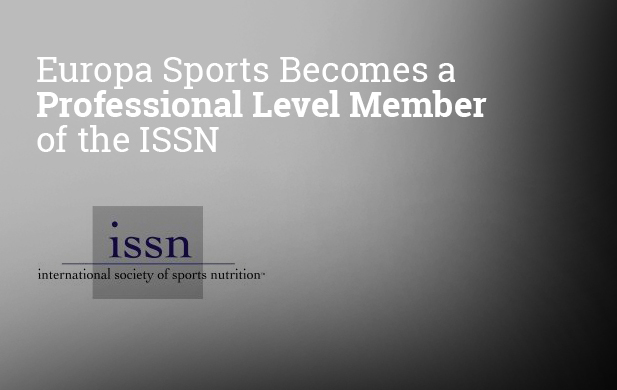 “Europa is pleased to partner with the ISSN as a professional level member. The ISSN is the world’s leading academic organization dedicated to the science of sports nutrition and supplements. Europa will look to the ISSN for the latest scientific research in the category to insure that its customers get the very best products. This will be a huge advantage for our customers and the many markets that are looking to optimize their inventory by bridging science and nutrition,” said Eric Hillman, Co-founder and Co-CEO of Europa Sports. Europa Sports has a strong track record of nearly 30 years of experience in the sports nutrition industry and works closely with manufacturers and key brand stakeholders to ensure efficient distribution of the highest quality products. With a mutual focus on the advancement of science and research, the membership will further fuel Europa’s ability to deliver evidence-based sports nutrition supplements across its nationwide distribution network. Based in Charlotte, NC, Europa Sports Products is recognized as an industry leader in the distribution of nutritional and sports supplements, sports drinks and accessories to mass market retailers, gyms, health food stores and specialty supplement retailers. Europa offers approximately 7,000 products representing 280 of the industry’s leading brands. With 10 massive distribution centers and offices strategically located nationwide, Europa’s expedited delivery process allows customers to keep “Just in Time” inventory. Europa is setting the industry standard in quality, product assortment, customer service and satisfaction. For more information visit www.europasports.com. credits by attending ISSN Conferences and Symposia. The ISSN is also recognized by many Universities as offering the latest, cutting edge and non-biased information about the science and application of sports nutrition and supplements. For more information visit www.issn.net.